Friends and family of recently sworn-in state lawmakers filled both chambers on the ceremonial first day of the 2019 legislative session. The Senate unanimously elected Senator Phil Berger to a 4th term as Senate President Pro Tem. The House elected Representative Tim Moore to a 3rd term as Speaker of the House. The General Assembly adjourned until January 30. Joint – The Crossover deadline is May 9. This means that a bill must be approved by its originating chamber and received by the second chamber by May 9 for it to be considered in 2019 and 2020. This rule does not apply to bills referred to the Appropriations and Finance committees. Christian Overton – Raleigh Dingman Award winner Christian Overton began his one year term as school board member adviser to the State Board of Education. As of January 11, NCSBA has received adopted resolutions from twelve school boards and five county commissions in support of school calendar flexibility (Burke approved a joint resolution). Please email a copy of your board’s calendar flexibility resolution to rbostic@ncsba.org. 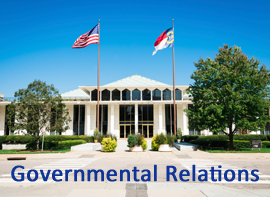 The NCSBA Legislative Public Policy Conference will held on April 30 and May 1 in Raleigh at the NCSBA Building. The agenda is still under development. Since the legislature is in session, it will give you an opportunity to visit with your legislative delegation. The early bird registration rate for the conference is $250 through February 28 and the normal registration rate is $325 starting March 1. Click here to register.